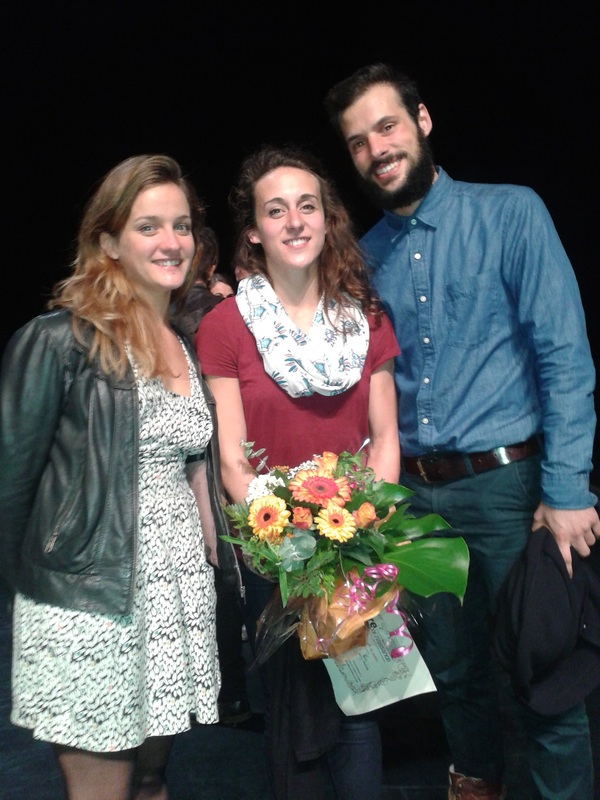 The three in the center, Collectif Es. Nous sommes tous à porter nos peurs enfouies, à chercher nos justifications, à donner le change. Les mots tentent de palier le corps, de dire pour, en place de. Hippopotomonstrosesquippedaliophobie, la "peur des mots trop longs", qui dilatent un contenu, mais qui diluent l'essence. Hippopotomonstrosesquippedaliophobie, comme une proposition souriante à emprunter le pas des craintes intimes, celles d'un trio dansé en recherche, qui livre en fraîcheur l'état de ses contradictions, entre ses envies de et ses doutes pour. Après avoir vu les 12 compagnies au cours du concours Reconnaissance organisé par CDC Le Pacifique à Grenoble le week end passé, nous tous membres de Communicating Dance avons décidé d'attribuer notre prix d'honneur au Collectif Es avec leur pièce Hippopotomonstrosesquippedaliophobie. The B Motion festival in Bassano del Grappa in August was a truly rich experience. Through the work I saw at the festival, my conception of what dance can be was challenged and expanded. For me, that alone is something extremely valuable. Below, I'm posting some of the writing I collected while at the festival. The first thing is a link to an e-zine I worked on while at the festival. The pieces included in this e-zine also appeared on the ABCdance blog, curated by Silvia. The second thing is an interview with Giulia Galvan about her work on choreography and its potential for influencing urban planning. how dance and the urban environment intersect. During B Motion, she arranged a walking tour that moved through the city, the mobile audience stopping to witness three very different performances in three locations. This is just one of several walking tours she has arranged. In advance of participating in the walking tour, I spoke to Giulia about her work, a 20 minute conversation snatched in a café between shows. choreography and urban planning working together. I suppose I mean it in the sense of re-connecting with a space that’s not yours any longer, or never was. Sometimes you live in an area, but you don’t feel so attached to it. So, re-appropriation of an area on the level of memory, of feeling. Let’s take the example of a district that is considered somewhere you wouldn’t like to go to, perhaps because it’s viewed as dangerous – you re-appropriate that area by creating a joint memory, maybe a pleasant memory of something you do there with other people. So you feel more attachment to that space – it’s not just a place you cross because you have to – but it’s something that belongs to you, and you belong in the space. It’s a deeper relationship with a place you live in or work in. Do you have the hope your project will have an influence on urban planning? Yes, I hope that. So that would be my provocation, for urban planners and choreographers to work together. Because after all, they have so many things in common. The idea of urban planning is not unlike devising the choreography of a city. It involves a deeper awareness of what it means to create a new building, preserve the one you already have, create walking paths or cycling lanes. I really hope an increased awareness can be triggered by the kind of speeches or actions I’m working on – not exactly mine, necessarily. But I’m talking about the transformation art can trigger in the memory or emotions with regard to a location. So it sounds like there are two sides to this project – that you hope there would be an effect on a personal level for the people participating in one of these walking tours, and that also there would be a more general or far-reaching impact on planning. I think so. The second one is a bit more difficult to achieve, but in the long-run, hopefully yes, because these decisions are made by people ultimately. How did you come to this area of interest in the first place? Well, I’ve been interested in contemporary dance for quite a long time and then at the same time I’ve always had a feeling for buildings. It really hurts me to see certain buildings being demolished or not used while elsewhere another building is being built that isn’t as nice. At the same time I really feel the potential of art to transform places which are considered not so nice or dangerous because I’ve perceived it myself. I lived in a neighbourhood where there was a bridge that people didn’t want to cross because it was considered dangerous, but following a performance that was staged there, people started to go to this bridge. But don’t you think this awareness of potential danger is necessary for self-protection in some cases? what can make a place dangerous is the fact that people don’t go there. It’s a ghost area. when there are too many people nobody takes care of each other. But, I can see it in my neighbourhood, there are no-go areas. And you plan to undertake a project in Dublin next year. What was the interest there? Yes, when I went to Dublin for the very first trip, I looked around and I saw that there was the interesting combination of avant garde buildings and Victorian buildings or older facility buildings. I was wondering what had happened with the other Victorian buildings. And then I asked around and discovered a lot of them had been demolished, and I took a picture of this Victorian building and two metres away there was a super modern building, and we have this kind of thing happening in Italy as well. So this is the sort of thing I wonder about – is it really necessary that you create this clash or can’t they be more favourably harmonised or organised? Is it necessary to tear everything down to create a new commercial area? I like the derelict buildings – they are sort of monuments for me sometimes. Sometimes, if they are not dangerous, they can be fascinating stages. What is it about tearing down old buildings to make way for new that is negative? you cannot just force people to go to a place – it takes time. I’m researching how the movements of people can create centres because this is how cities developed in the very first place. I’m interested in the choreography of people towards certain centres, and how forced it is, or how spontaneous. Sometimes, the ‘tearing down’ style urban planning attempts to make people to go there on a forced level. But, I’m not against new things just for the sake of it. It makes me think of business districts in cities. They’re often completely dead at night time and at weekends – it’s a very artificial environment. So, when you use the word choreography in relation to cities, I think of a force that is creating or controlling from the outside. But when you talk about choreography of the city, are you also thinking about spontaneous, independent movement? What people do themselves, without being directed? I would like to encourage awareness of one’s own choreography in the city. Usually when I go to a new city I take a map and I like to draw the movements I do inside the city. When you walk, you are not simply going from A to B, but you are going through AB, the trajectory between A and B. Part 1 – Rotterdam ho! Liv and I attended the Rotterdam Festival de Keuze, a multi-disciplinary festival, for our mobility. 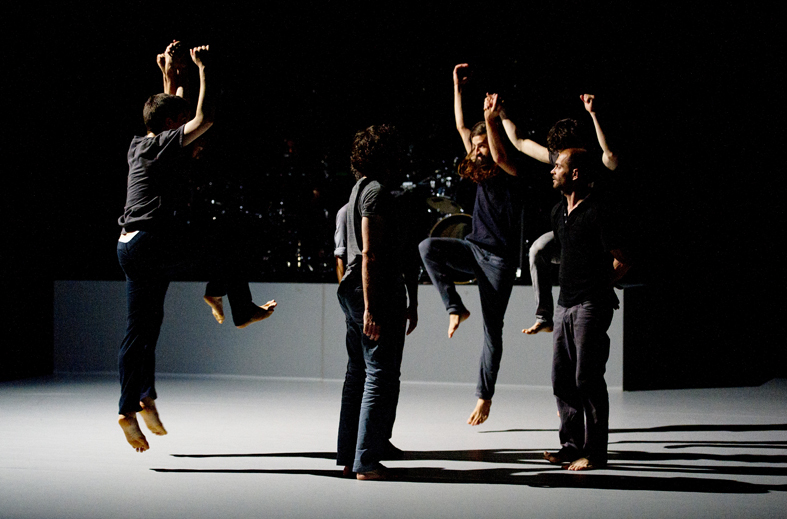 As a context for testing the concept of what ‘communicating dance’ means, it was full of potential. Firstly, the entire festival was contained in the Rotterdamse Schouwberg theatre, a set-up that meant performers and audience members mingled in the foyer between performances. Secondly, we had an all-access pass to every performance in the programme while we were there. And finally, one of the festival’s producers, Ravian van den Hil, was on-hand to help us gain access to artists and festival insiders. Part 2 – You want us to do what? On the day we arrived, we met Ravian and Yira, the social media and output manager for the festival, in the foyer of the theatre. We came with the expectation of hearing about how we could best communicate dance while we were at de Keuze. The message we received was a strange one. The festival did not have a dedicated blog of its own, so the organisers were happy for us to use whichever forum we chose to talk about the work we saw (Twitter, Facebook, Instagram, a personal blog, etc.). They were eager to generate as much social media buzz about the festival as possible. However, it was suggested that we only post positively about what we saw, and that if we had a negative reaction to something we might like to focus on another aspect of the performance (music, costume etc.) we felt more admiration for. This approach makes very good sense for someone interested in promoting the festival and selling tickets. However, as participants of a programme interested in exploring what it means to communicate dance, it seemed at best unimaginative and at worst superficial. Before coming to Rotterdam, Liv and I had launched an online pilot issue of a magazine called DRAFF. The crucial point about DRAFF is that it’s artist driven, with the material coming directly from the artists themselves. The first pilot issue had covered the Dublin Fringe festival the previous month. After talking a bit, we decided to DRAFF the Festival de Keuze. Instead of posting diluted comments about the work we’d seen on various social media outlets, we’d try to give both those who had attended the festival and those who hadn’t an insight into the work that goes on behind the scenes of a performance. As a secondary motivation, we thought it would probably teach us a thing or two to put together an issue about artists we didn’t already know personally (as was the case with many of the artists in Dublin, whose work we were familiar with). We set to work emailing artists directly, or pouncing on them in the foyer of the theatre when they had already been rendered defenceless by wine. In general, we got a very positive reaction and artists happily sent us lots of images, audio files and text excerpts. We chose from these and gradually put together our second issue, dedicated entirely to Festival de Keuze. It was a communication about dance (and theatre), but one from a position of curiosity, rather than opinion (whether sincere or not). It was communication from no one place, which, as a happy coincidence, allows you to look at things from many places. I often us this term in order to describe dance or choreography. But it simply does not apply in this case. 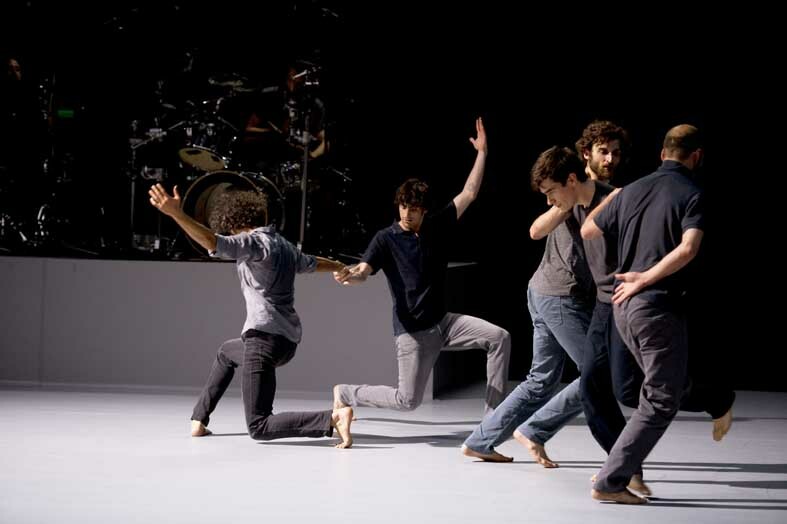 The eight male dancers in Christian Rizzo's piece do not dance to please the viewer's eye or aesthetic desire. Their dance is exciting, electrifying and elegant but it does not attempt to be beautiful. Fabien Almakiewicz, Smain Boucetta, Massimo Fusco, Miguel Garcia Llorens, Pep Garrigues, Kerem Gelebek, Filipe Lourenco, Roberto Martínez dance in order to tell us the story about a musical journey around the world during which we encounter other cultures, rituals and dances. The fact that we are somewhere else is highlighted at the very beginning of the piece. The first dancer approaches the stage and before stepping on it he takes off his shoes. A habit known from southern and middle eastern cultures. Gradually the other dancers approach the stage in order to join him, they first stop at the different sides and edges. A gesture typical for folkloric dances throughout the world. These subtle choreographic hints help us understand that we are guests watching a journey evolves. It begins in Valencia moves on to Athens, Jerusalem, Arnedo, Replonges, Bourges, Lima and ends in Istanbul. Didier Ambact and King Q4 are the rhythmic companions of this journey. These two musicians masterly extract the pure rhythmic essence of folk songs without loosing any musical essence of the pieces. Both are situated in the left rear corner of the stage on a pedestal so that they and their drums are visible. They “beat it” and their sound gives the piece its tempo. I could hardly sit still while I watched – if it were not my feet moving, it was my head, my hand or my shoulders.... I was not the only one. A glimpse around me and I was assured that the rhythm was getting almost everyone at Kampnagel2. When a movie starts or ends with this line the attitude and perspective of its viewers often alters. This is not a story a person has invented. This has happened in real life - leading to more empathy, astonishment or disapproval. One could say the portion of feelings involved becomes bigger once this line is dropped. But what does it mean when a dance theater choreographer uses this line as the title for his work? While watching the piece I kept looking for clues to connect the movie experience to the dance theater experience. But it was only after buying the CD that I understood the disconnection. While before I only had clues for being on a folkloric journey now I had the names of the cities. “After a true story” in Rizzo's piece is about him and his team traveling to different spots of the world in order to learn about traditional folkloric dance. They are the viewers in this case experiencing a true story. In fact the “mise en Scene” points this out. In the right front corner of the stage are placed a chair dropped on it a coat, several books and dark colored orbs on the ground. These objects in my opinion symbolize Rizzo's travels to different cities as the observer, who then returns and tells his “true story”. After two-thirds of the piece these objects are moved away by the dancers again hinting that the pure observation is only one portion of this true story the other being the magnificent interpretation of folkloric dances that took my breath away.